2019 is the year that Goggins Transport, one of Ireland’s leading haulage companies, celebrates 40 years in business. Appropriately, the Dublin, Galway & Liverpool based firm has chosen to mark the occasion by adding six new Mercedes-Benz Actros trucks to its extensive fleet of commercial vehicles and trailers – one of which will carry the registration plate 191-G-1979, in celebration of the year the business was established. In addition, to further acknowledge the significant milestone, the company is in the process of restoring one of their very first Mercedes-Benz trucks from 1979. The new additions – which include four 2548LS StreamSpace cabs and two 2548LS BigSpace cabs – bringing to 67 the number of Actros now on the company’s fleet. Delivered in Goggins Transport’s distinctive white and red livery, the trucks are finished with 40th anniversary motifs on each cab. A Mercedes-Benz customer since the company’s foundation, Goggins Transport managing director, Declan Goggins, says the new additions point to the ‘proven reliability and excellent fuel savings’ that the other Actros on the fleet deliver, year after year. 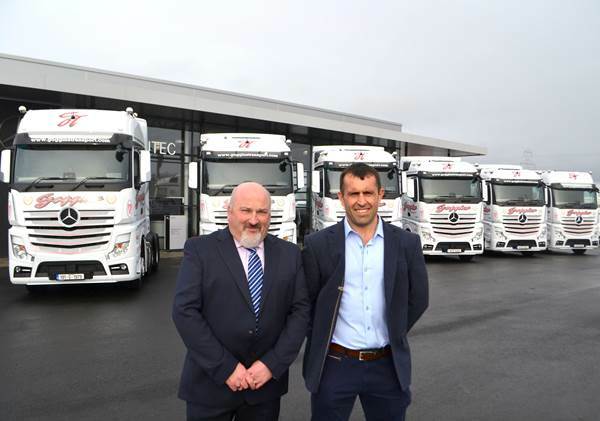 A privately owned, family run freight company, Goggins Transport has two depots in Dublin, one in Galway and one in Liverpool and operates a modern, assorted fleet of over 90 vehicles and 220 trailers between Ireland, UK and mainland Europe, all of which utilise gps tracking for peace of mind and live updates.